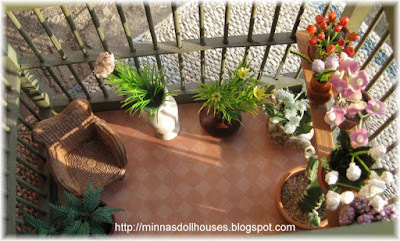 This is Maria Ulriika's conservatory, one of my flea market bargains. I have printed the flooring. The chair is ceramic and I have found it in a flea market, too. I have made the flowers from pieces of silk flowers and from plastic miniature plant kits. Tämä on Maria Ulriikan kasvihuone, yksi kirpputorilöydöistöni. Lattia on printattu. Tuoli on keramiikkaa ja kirpputorilta sekin. Kukat olen tehnyt silkkikukkien osista sekä muovisista viheraskartelutarvikkeista. So pretty! It all turned out great. I love it. I need to work on my minis again soon. Oh, it is wonderful! Great find! What a marvelous job on a flea-market find! I really like the color of the printed floor. All I need now is a cup of green tea, a good book, and I'm all ready to curl up in the sunshine. Onpa kaunis ja tunnelmallinen kasvihuone! Kyllä kelpaisi tuolla ihastella kesän tuloa. Ihanan näköistä! Minna, what a great find! 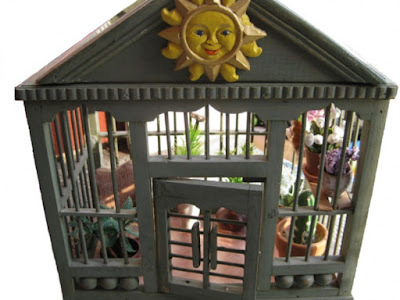 I love the little sunshine fellow on the front of the conservatory . . . he's very happy! Also a note to let you know that I've tagged you! Please visit my blog for all the details and have fun! You've done a great job!!! Wow! I'm speechless! It's amazing! The conservatory looks so nice! I have just bought myself a gazebo for the dolls (really a garden lantern) and your conservatory has given me a lot of inspiration!